All photography provided by Dahl Media / Hvalerbilder. 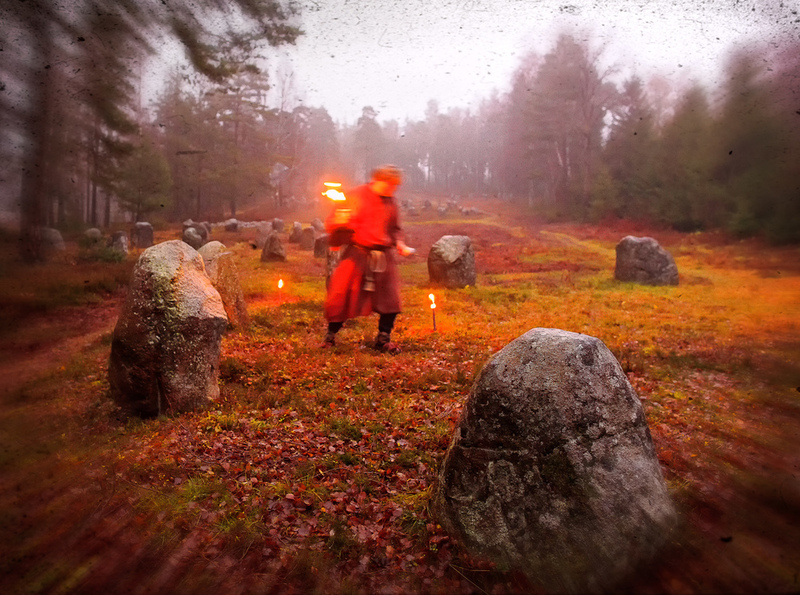 You will find many places near Fredrikstad and Hvaler with amazing stories from our Bronze Age ancestors. Østfold is the Norwegian county with the second most petroglyphs, and Skjebergsletta outside Fredrikstad is the area with the most in Østfold. In this rich cultural landscape at the bottom of Skjervegkilen are over 100 engravings on islets and sloping mountain rocks. Ships are popular motives in farm petroglyphs. Viking ships are not carved, but perhaps a precursor for them. If that is the case, these were ships without sails, but ships which were paddled forward as we can see in some carvings, or later rowed. The crew can be more or less clearly stated, but usually in the form of vertical bars. Details of the ships can sometimes be seen, but often in such a way that we are unable to say with cretainty what this is, exactly. Ever since the inland ice cap retreated, leaving av narrow strip of dry land along the coast, people have lived in Østfold. 10,000-12,000 years ago, the first hunters came paddling in their skin boats across the sea, and from the moment they landed, they left their marks. Findings at the stone age settlements at Høgnipen, located on the border between Rakkestad and Skjeberg, confirms and proves that the first humans probably arrived in Østfold during the above period, and that they were the very first to take possession of the land. An important part of Norway's history starts right here. in Østfold are numerous rock surfaces bearing traces, not only from the shape and texture left by the ice cap, but also traces of human art. Petroglyphs in Norway were made during several thousand years, from shortly after the end of the Ice Age ten thousand years ago and well into the Iron Age in the centuries after the birth of Christ. During this long time, many kinds of engravings were made. Petroglyphs are images or symbols which people of that time engraved into rocks and mountains. There are more questions than there are answers about the symbolism of the petroglyphs. We do not know why they were made, but many historians believe that the figures can be linked to religious practices, such as sun worship or fertility wishes for animals and humans. it is common to talk about two groups of rock carvings in Norway, and also in the rest of the Scandinavian countries for that matter. The oldest group is often called veideristninger (rock engravings) because motives are associated with hunting cultures. These engravings are sometimes also called stone age engravings because many archaeologists consider them to have been made during the Stone Age. The big ship figure at Navestad Pyntelund, known as "Bjørnstadskipet" (TheBjørnstad Ship), is one of our most famous petroglyphs. The Bjørnstad Ship is Northern Europe's largest single petroglyph motive. It measures 4.5 meters. The other boats seem small in comparison, even though they are major motives, themselves. Veideristnings were engraved into the rock by some of the first hunters who came to the country after the Ice Age, around year 8000 BC and for a period of no more than 1500 years. Only wild animals are depicted in the engravings. That is what above all else connects them to a hunting environment. That is also what made many scientists believe that they were made as parts of hunting rituals to ensure a good outcome of the hunt. Today we believe that significance of pertroglyphs was perhaps more abstract, like symbols for clans and individuals, and that it is in this capacity they appear in the petroglyph areas. The youngest main group av petroglyphs are for similar reasons called farming carvings or bronze age carvings. Unlike the veideristnings the bronze age carvings were not engraved, but cut or carved into the rock with a stone or another hard tool. Archaeologists have so far not succeeded in pointing out exactly what kind of tools were used. It is therefore difficult to say for sure. We are left with imagining that hard stones were used, but no such stones have ever been found near a petroglyph. The first farm carving was cut fairly early in the Bronze Age, ie. approximately 1600-1800 BC. The motives of such carvings are often figures, people, ships, animals, symbolic artwork, indeterminate objects, tools, sleighs and other vehicles.